Congdon. (2010). Archipelago. In B. Warf (Ed. ), Encyclopedia of geography. [Online]. Thousand Oaks: Sage Publications. Available from: https://search.credoreference.com/content/topic/archipelagoes [Accessed 25 April 2019]. Congdon. "Archipelago." Encyclopedia of Geography, edited by Barney Warf, Sage Publications, 1st edition, 2010. Credo Reference, https://search.credoreference.com/content/topic/archipelagoes. Accessed 25 Apr. 2019. (ärkĭpĕl'Әgō) [Ital., from Gr.,=chief sea], ancient name of the Aegean Sea, later applied to the numerous islands it contains. The word now designates any cluster of islands. The term archipelago is most commonly used to refer to a group or chain of islands, although it can also refer to a sea containing a large number of islands. These islands are typically tectonically formed island arcs resulting from volcanoes (e.g., the Galapagos Islands) or hot spots in the lithosphere (e.g., the Hawaiian Islands) but can also form from erosion, deposition, or land elevation. They are usually found in the open ocean, although occasionally archipelagoes are near large landmasses. The word archipelago is ultimately derived from the Greek arkhon, meaning chief or ruler, and pelagos, meaning sea. The ancient Greek name for the Aegean Sea, which is dotted with small islands, was Aigaion Pelagos, which later became simply Archipelago. Today, the word is used more broadly for any group of islands or sea containing many islands. The largest archipelago in the world by number of islands is the Canadian Arctic Archipelago, with 94 major islands and 36,469 minor islands covering more than 1.4 million km2 (square kilometers). The largest archipelago by area is the Malay Archipelago, which includes several nations spanning the distance between southeast Asia and Australia, including approximately 20,000 islands (depending on season and tide) and covering more than 2 million km2. The Malay Archipelago encompasses the nations of Indonesia, the Philippines, Singapore, East Timor, Brunei, Malaysia, and Papua New Guinea. Some of these could be considered separate archipelagoes in their own right, particularly the Philippines. Other nations that are primarily archipelagoes include Japan, New Zealand, and the United Kingdom. The Isles of Scilly, an archipelago of approximately 150 islands, is located some 44 km southwest of the westernmost point of England. 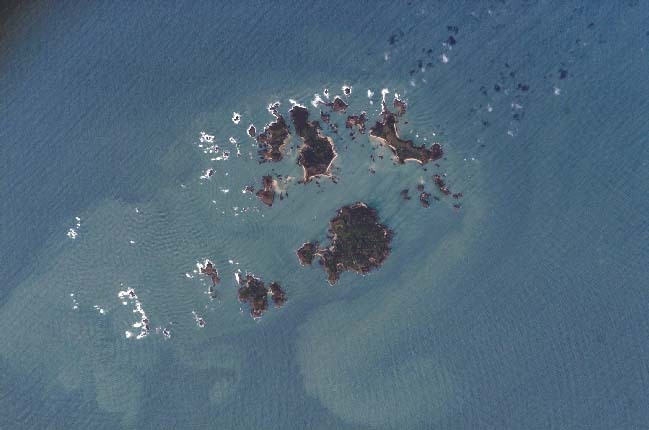 Archipelagoes have a unique relevance and usefulness among land formations for the study of evolution. According to island biogeography theory, the size of islands and the distance between them will interact to affect species immigration rates, colonization abilities, and local extinction rates. Their isolation from other systems increas es the endemism of resident species (i.e., the likelihood that they are found nowhere else on Earth), and they are often the site of adaptive radiations. In fact, both Charles Darwin and Alfred Russel Wallace developed many features of their groundbreaking hypotheses with regard to natural selection and biogeography by studying archipelagoes—Darwin in the Galapagos, and Wallace in the Malay Archipelago. Grant, P. R. (Ed. ), (1998). Evolution on islands: Originating from contributions to a discussion meeting of the Royal Society of London. New York: Oxford University Press. Wallace, A. R, (2000). The Malay archipelago: Vols. 1 & 2. The land of the orangutan, and the bird of paradise. A narrative of travel, with sketches of man and nature. Berkeley, CA: Periplus Editions. (Original work published 1890). Copyright © 2010 by SAGE Publications, Inc.
Map of the Lesser Antilles.